I gotta give it to Google today. Their search engine is offering a shootout game. Give it a try if you get some time. All you need is your left and right arrow keys and the space bar. Good luck. I know you probably stumbled across this in your mad search to see who won between US v Japan, that'll come later today. In the mean time, perhaps you haven't been paying attention to the other women's NT team playing. In Turkey. At the World Deaf Championships. The ladies started their journey on July 18th, in a close 1-0 win versus Russia. They ended with the title, 10 days later against the same team and with the same result. In their wake, the US Women beat Russia 1-0 (twice), Japan 4-1, Germany 8-0, and Poland 3-1. The US Women went 5-0-0 in their title run. In the final, Stacy Messner scored a first half goal and managed to hold onto the lead through strong defense and keeping. The men's NT also traveled to Turkey and competed. While they fought bravely, their run was a little less distinguished. The men's format was set up like the Euro 2012 competition, i.e.- 4 groups of 4 teams each, with the top two teams advancing out of each group. "Because most deaf national teams end up paying their own way to the tournament, the tournaments usually guarantee more games. Thus, the bottom two teams in each group go on to play for places; third place teams play for 9th through 12th place, and 4th place teams play for 13th through 16th place." 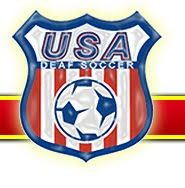 - Mark Sorokin, US Deaf Soccer NT player/US Deaf Soccer Board VP. Despite opening with a 6-4 win v. South Korea, the US dropped 2-0 to Germany and drew the hosts, Turkey, 1-1. With that final result, the US dropped to third in the group (had they won, they would have advanced and Turkey finished 3rd in the group). Their consolation match, they unfortunately lost narrowly, 1-0 to Uzbekistan. In the final match the US lead Greece only to give up 3 unanswered goals after leading 3-1. The result wrapped up the tourney for the US. Their final record was still a respectable 1-0-3 against strong competition.